This guide will get you started but we recommend that you consult the team at The Carpet and Flooring Company particularly for complex areas – such as a hall, stairs and landing – or one that may require a join. 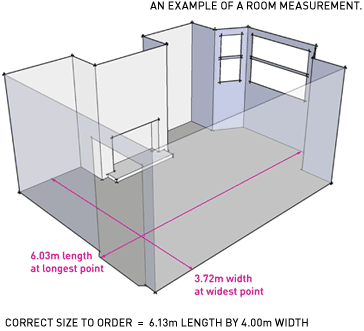 When measuring a room, simply measure the maximum length and width of the room. When measuring into a door, measure from the opposite skirting board to where the carpet will finish underneath the door. We always advise that a minimum of 10 centimetres is added to each measurement to allow for cutting and trimming i.e. if your room measures 5.90m length by 3.81m width, the correct size to be ordered will be 6.00m length by 4.00m width.